Tech N9ne and Strange Music, in conjunction with the Independence Events Center, are proud to announce the first annual Tech N9ne – The Gift Of Rap 2012 concert, December 7th at the Independence Events Center. Featuring the Kansas City King, Tech N9ne, in his hometown, along with special guests Krizz Kaliko, Kutt Calhoun, Rittz and others, this will be an event not to miss! This concert will benefit the Love Fund For Children and Harvesters Community Food Network. Donations of non-perishable food items, various hygiene/lifestyle items for boys and girls (see the list below for suggestions and ideas), as well as unwrapped, new toys and games will be accepted at the door.Plus, all qualifying donations will receive a $10 merchandise voucher, redeemable at the Strange Music merchandise booth the night of the show! With additional support from generous sponsors such as CBS Outdoor, Simon Malls, DSS, Inc., Gates BBQ, Colormark Printing, Monster Energy, The Wrap Factory, Mix 93 and KC Trends, this show will be the most talked about event of the season. For more information, check out therealtechn9ne.com or any of our sponsors websites. Tickets are available at all Ticketmaster outlets or the Silverstein Eye Centers Box Office at the IEC. 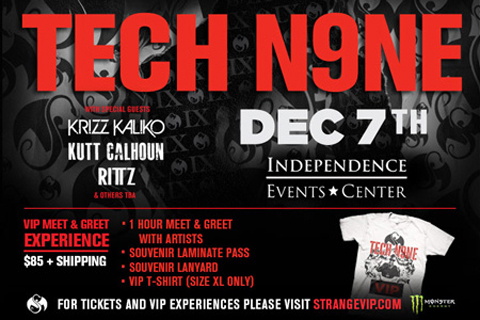 We look forward to seeing everyone at Tech N9ne – The Gift Of Rap 2012, December 7th at the Independence Events Center! Gift cards from CVS, Best Buy, Target, K-Mart, iTunes, Walmart, movie theatres, malls, restaurants, etc. Just Announced: Bay area rap legend, E-40, will be joining Tech N9ne for The Gift Of Rap 2012 at the Independence Events Center on Friday, December 7th! Do not miss your chance to see what is sure to be the most talked about concert of the holiday season! CLICK HERE FOR VIP PASSES AND TICKETS!